By the end of the month, people will be heading out to the beach and events get scarce, but until then, we've got 60 - 60! 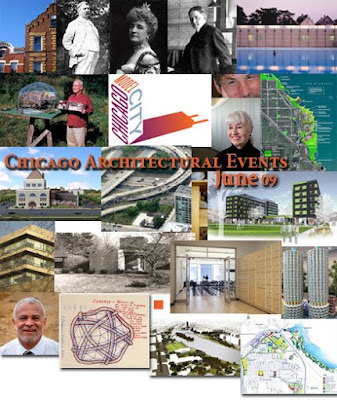 - architecture related events on the June calendar. It starts out with the Grant Park Advisory Council considering the new Burnham Memorial, then there's Pecha Kucha 9 on Tuesday, a three day symposium on the legacy of Jens Jensen, Preservation Chicago's Pilsen fundraiser, SEAOI's annual banquet honoring the best engineered buildings of the year, Chris Lee talking about plans for restoring Adler & Sullivan's Pilgrim Baptist, at CAF. where on another date Dirk Denison will also be speaking. 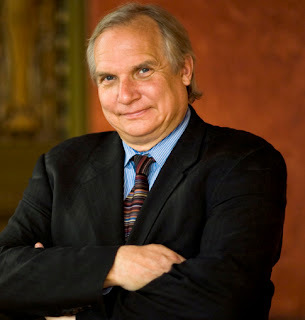 Also at CAF, Donald L. Miller discusses Daniel Burnham, while Arthur Miller discusses Edward Bennett and Uncle Dan's shadow for Landmarks Illinois at the Cultural Center. 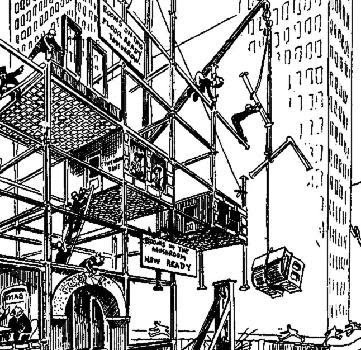 There are receptions for new exhibitions: Model City, at CAF, David Woodhouse Architects, at I Space, and Daniel Burnham's Vision of an American Metropolis, at the Newberry Library. Again at CAF, Grahm Balkany talks about the Walter Gropius legacy at the Michael Reese Hospital that the city's hot to destroy. (The campus has now been sealed off so people can no longer see what they'll be missing: surprise, surprise.) And then there's this year Canstruction at the locale formerly known as the Apparel Center. Could this be the year we'll see Trump Tower realized in tuna and sardines? Check it all out - and decide for yourself what you can't miss before you bundle the family and its pets into the Rambler American . . . here. Crain's is reporting that the Illinois Supreme Court has declined without comment the Daley administration's appeal of the ruling of a lower court led by a hack political judge that decimated the law that protects Chicago's landmarks. 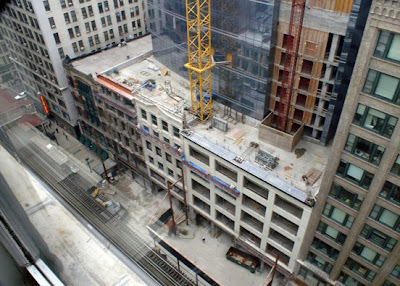 The case is now remanded for retrial but the original ruling is expected to provide the Cook County Court no other option but to affirm the original finding that the landmarks ordinance is unconstitutional. Read Crain's report here. Our original report here. Today, the Chicago Tribune has been without a primary editorial cartoonist for years, another sign of the decline of print journalism. But for over almost sixty years, from 1889 through 1946, most of them at the Trib, cartoonist John T. McCutcheon created, in the words of the subtitle of a new exhibition opening tonight, Friday, May 29th, at the Chicago Cultural Center, Chronicles of a Changing World that documented the evolving story of America, often reflected in the light of the Trib's conservative outlook. 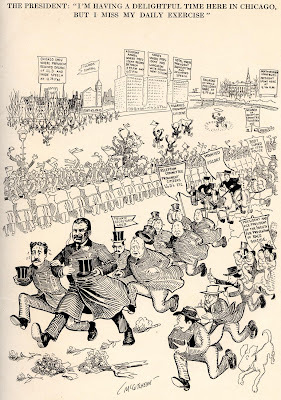 The Pulitizer-Prize winning McCutcheon was known as the "Dean of American Cartoonists." His take ranged from the whimsical, as in this portrait of a whirlwind visit to Chicago by President Theodore Roosevelt . 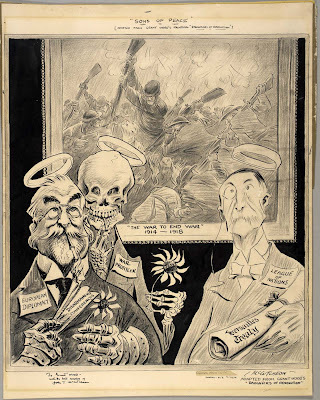 . .
to this bitter commentary on the aftermath to World War I, reproduced courtesy of the Smithsonian. The new exhibition shows the wide range of McCutcheon's beautifully drawn work, both as a political commentator and as an acute observer of the everyday life of his times. Tonight's opening reception, running from 5:00 to 7:00 p.m., features a 5:30 p.m. gallery talk by exhibition curator and Chicago cultural historian Tim Samuelson, who not only has no equal in his knowledge of the city and its history, but draws on a seemingly inexhaustible wealth of great stories to tell, as well. Samuelson will also be giving gallery talks at 12:15 p.m. on June 4th and July 9th, both Thursdays. 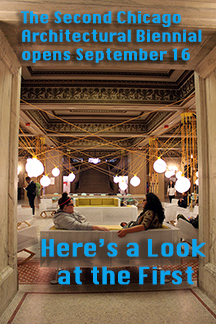 The exhibition runs through September 27th in the second floor Chicago Rooms of the Chicago Cultural Center, 78 E. Washington. Did I mention it's all free? The New Old Colony: How Good Dare We Hope It Can it Get? 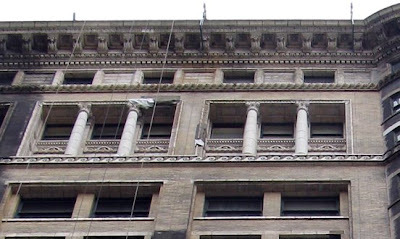 High hopes are meant to be dashed, but what's going on at Holabird and Roche's landmark 1894 Old Colony building is close to a revelation. 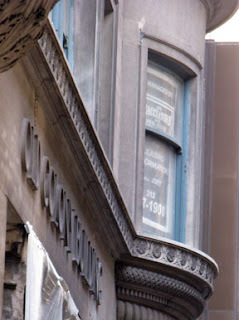 We've written previously about reports the tragically derelict building had been acquired by Joseph Cacciatore & Company, and now it's official: they have a leasing poster in a prominent second story corner window. The firm, I'm told, has a mixed record on issues of restoration, but as the cleaning of the Dearborn Street facade continues, the Old Colony increasingly escapes from its Stygian Blade Runner-like gloom to reveal a light-colored building with an astonishingly beautiful classically styled arcade at the top. And as I walked by again this past weekend, I discovered something else amazing. 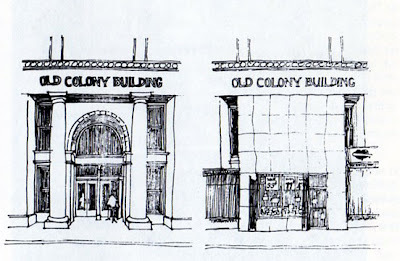 For time immemorial, the Old Colony's original Van Buren entrance, shown in this Harry Weese before and after sketch . . .
has been converted into a storefront, its facade obliterated with a thoughtlessly uncontextual coverup. 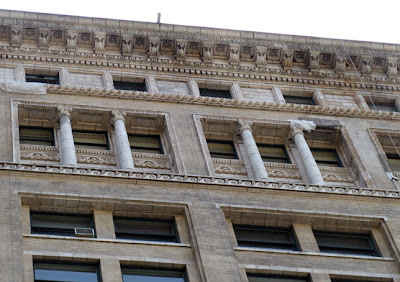 Today, however, for the first time in probably at least half a century, you can see the original columns and pilasters of the Van Buren entrance. 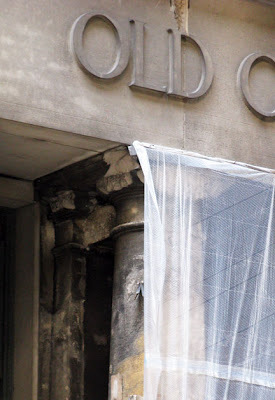 I'm sure it's too much to hope that the Old Colony's main entrance might be restored to its orginal glory, especially given that Harry Weese in his 1970's study said all documentation for the lobby had been lost, although he offered up this possible reconstruction. Still, for a moment at least, we get to think of what might be. 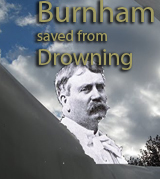 We'll be starting on the June calendar in another few weeks, but we've just added still another two Burnham-related events to the May calendar. New Visions for Global Cities - Wednesday, May 27th, beginning with a 5:30 p.m. reception, here's a program with globalization author Saskia Sassen and Simon Menner, the German photographer whose series Metacity, "recording the informal structures of the homeless in the cities of Bombay, Chicago, and Paris" is part of a new exhibition, Edge of Intent at Columbia's College Museum of Contemporary Photography. This is perhaps the best Burnham-related show I've seen so far, and I hope to be writing more about it soon, but if you attend this Wednesday's event, co-sponsored by the Chicago Council on Global Affairs and the Goethe Institute of Chicago, you can check it out for yourself, as it's taking place at the museum, 600 South Michigan. $20.00 for members, $30.00 non-members, info and registration here. 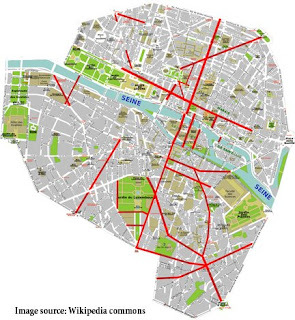 Sciences Sociales, Paris, will be presenting their recent work on the shaping of Paris around the year 1900. Info here. There's also a 10:00 to 1:00 p.m. seminar on the same topic. This week is something of a Burnham Bender, with a Tuesday event on Burnham's recruitment of Edward Bennett, Kristen Schaffer's lunchtime lecture at CAF on Wednesday, and a two-day conference Burnham, Chicago, and Beyond: Politics, Planning, and the Progressive Era City, at CAF and DePaul, Friday and Saturday. And in the line of other current obsession, Lori Healey talks with Lee Bey on The Chicago 2016 Olympic and Paralympic Bid, at AIA on Wednesday. Check out all of this week's events here. A press story from the University of Michigan is currently circulating on a bendable new engineered cement composite (EEC) with the capacity of healing its own fractures using only air and water. In this video, U of M professor of Materials Science and Engineering Victor Li explains his new material. “Self-healing of crack damage," he says, "recovers any stiffness lost when the material was damaged and returns it to its pristine state. The material can be damaged and still remain safe to load.” The average crack, about half the width of a human hair, reacts with water and carbon dioxide from just "a handful of drizzly days" to form a compensatory scar of calcium carbonate, the stuff of sea shells and, after a few million years, limestone. Professor Li now turns his attention to his ultimate obsession, the development of an EEC trampoline. The glass curtain wall of Mesa Development's slender tower, which rises up behind the Holabird & Roche/Louis Sullivan Gage Group as it redefines the landmark Michigan Avenue streetwall . . .
. . . continues to climb up towards the crest of the reinforced concrete structure as the Legacy moves closer to its opening date this fall. Their beauty was apparent even as I took pictures of them this past winter against the stark, naked branches of the leafless trees, but taking the tour given by scholar Grahm Balkany of the Gropius in Chicago Coalition Sunday afternoon, and revisitng the Bauhaus-inspired buildings on the Michael Reese campus now embraced by the lush foliage of the landscaping - and especially the stunning parks created by Hideo Sasaki - the full extent of the outrage the city seeks to commit by erasing all trace of the complex to create a tabula rasa for a developer-to-be-named-latter for a billion dollar athletes village for a still-to-be-awarded 2016 Olympics became painfully acute. And here's a photo of the sunscreens on a building where Gropius's involvement, working with Reginald Isaacs, and Loebl, Schlossman and Bennett, is fully documented, the wonderful Kaplan - originally Private - Pavilion, which reimagines the Bauhaus building in Dessau through the roots of Chicago architecture. 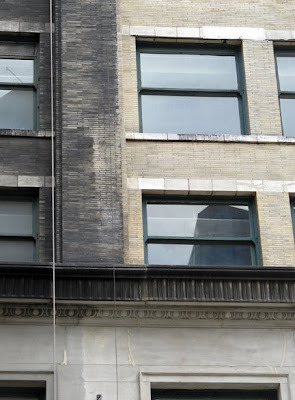 Notice how the ribbon windows are actually a derivation of the original Chicago Window, which consisted of a large fixed central pane, with smaller, operable windows on either side. In the Kaplan, the pattern becomes more complex, with the smaller windows repeating in both doubles and quadruples. 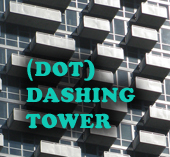 Although it provides a real sense of animation to the facade, it's anything but arbitrary. 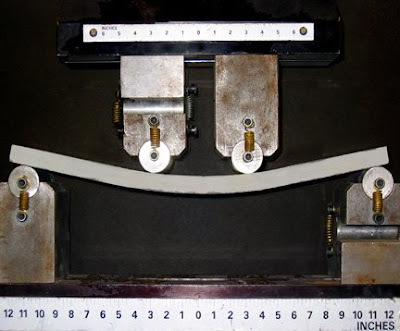 The groupings of four center on a drywall partition; those of two appear before structural columns. 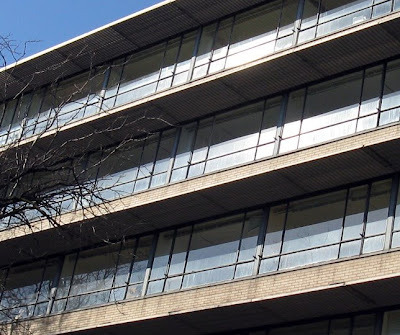 And the pattern becomes even richer with the windows split into upper and lower strips. Much more later. For now, time is short. 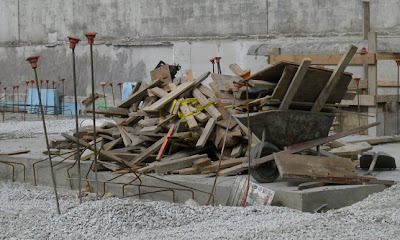 The buildings are already being trashed and vandalized as the interiors are stripped of furnishings. 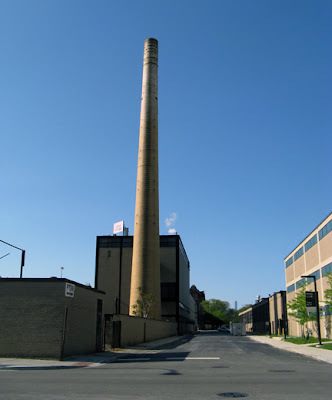 The Illinois State Preservation Agency has initiated a review of the complex's historic status, and one of the ways you can do your part is by writing a letter supporting preservation. Details here. from today's ribbon-cutting ceremony, complete with badly shot video . 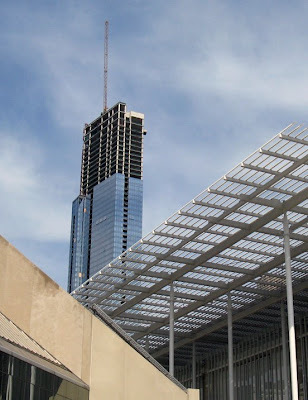 . .
Renzo Piano, architect of the new Modern Wing of the Art Institute of Chicago, discusses the building.
. . . and here he talks about the Nichols Bridgeway, which connects Millennium Park with the public sculpture garden on the Modern Wing's third floor. 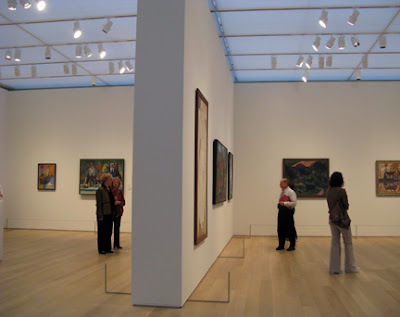 OK, let's face it, many of us will be joining the teeming hordes checking out the new Art Institute and Nichols Bridgeway, but admission is free all week, through the 22nd, and you can beat the crowds by visiting two other highly worthwhile events that are in their final days. 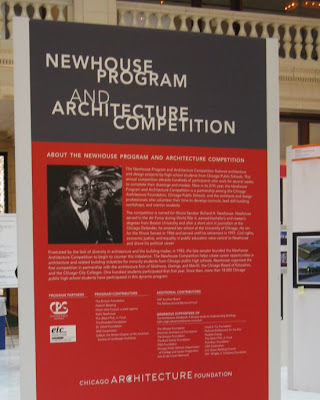 Richard Newhouse Program, Competition and Exhibition only through May 19th. 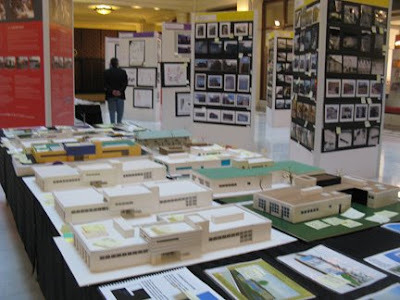 Every year I mean to write about this great program, now in its 27th year, started by the late Senator Richard Newhouse in 1982 to increase opportunities for minorities in the fields of architecture and design by involving high school students from the Chicago Public Schools. It's grown from the participation of 100 students in its initial year to 18,000 today, with 1192 registrations for the competition in nine different differences from model making, to photography, architectural renderings both hand drawn and computer generated, photography and full-up design, this year including a food cart for delivering healthy comestibles on school grounds, and creating a residence for a homeless woman using two shipping containers, and a community center combining recreation and education space. The program's curriculum is based on now the Chicago Architecture Foundation's curriculum The Architecture Handbook: A Student Guide to Understanding Buildings, which has just received the American Institute of Architect's 2009 Honor Award for Collaborative Achievement. This year, I was honored to be one of the judges for the competition and, as always, was blown away by the work, and by the commitment not only of the students but of the dedicated teachers working with them. 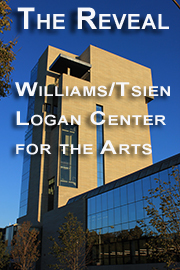 In a ceremony at Symphony Center's Buntrock Hall this week, 120 prizes were awarded. Six students will be going to a one week Taliesin Apprenticeship at Frank Lloyd Wright's Spring Grove, Wisconsin home. And, in spite of the troubled economy, Chicago architectural firms have provided 14 summer internships for participating students. 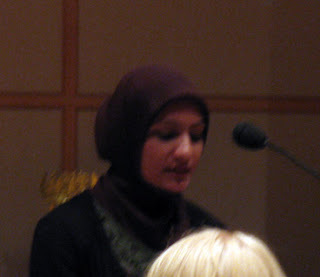 Farhia Wajid, pictured here, who won first prize for her essay on how President Obama could deploy stimulus funds to jump start productive changes in the built environment, will get to spend her summer as an intern at Studio/Gang. 42% of all U.S. energy is used for lighting. An "olf" is a unit of measure capturing the scent emission of an "average person - 'a sitting adult that takes an average of 0.7 baths per day . . . and whose skin has a total area of of 1.8 square meters. 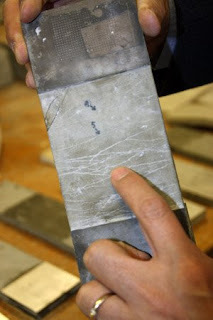 Marble has a rating of 0.01 olf per square meter; a heavy smoker, 25. The skin of a human body has ten receptors for sensing cold for every one receptor for sensing warmth. 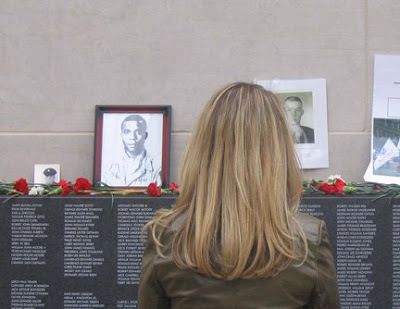 Dedication day events begin at 9:00, with the ribbon-cutting scheduled for 10:00 a.m. Free admission Saturday, May 16th through Friday, May 22nd. 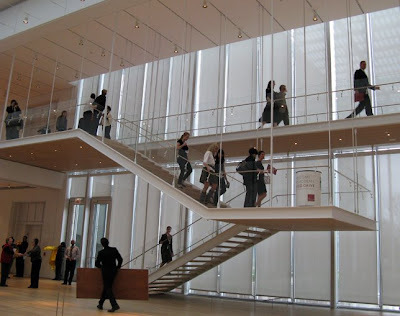 65,000 square feet of new gallery space in an instant landmark designed by architect Renzo Piano. 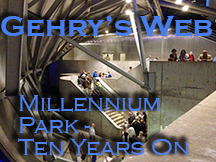 This will be your first chance to traverse Piano's Nichols Bridgeway, the 620 span linking the Modern Wing to Millennium Park. 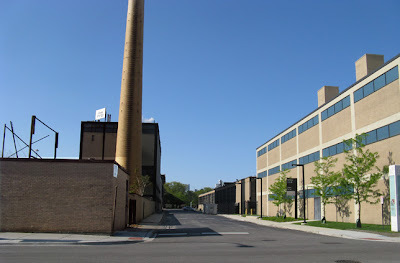 For opening week, the AIC is partnering with the Greater Chicago Food Depository, which has experienced a major uptick in the demand for their services in today's troubled economy. 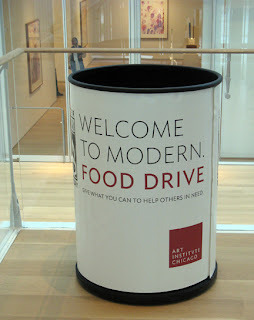 Visitors are asked to bring canned goods to the museum to help provide food for the Chicago community. And no, we're not talking the discus or shot put . . . something more like the high hurdles and sprint, with a bit of the hammer throw added in when our mayor and his disciples get involved. 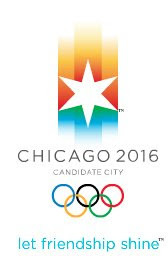 Tonight, Thursday May 14th, the U.S. Green Building Council is hosting 2016 President Lori Healy and The Climate Group's Allison Hannon talking about all the wonderful things the 2016 Olympics will bring to Chicago. Evening begins with networking and appetizers at 5:30, with the program at 6:45, at Hermann Hall, IIT. As I write this, there were still about 71 spots open for registration. Info here. Then on Saturday, May 16th, 9:00 - 11:30 a.m., there'll be a community meeting at the Washington Park Refectory, 55th and King Drive. 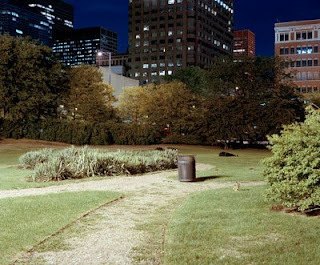 Chicago Park District historian Julia Bachrach will "review the history of Washington Park and comment on its historic value. There will be a discussion of the effects of the 2016 Olympic Games on Washington Park's historic integrity." Info here. And on Sunday, you can get an idea of the kind of damage that city's rush to the Olympics might bring with a free tour ($10.00 suggested donation to fund continuing research) of the historic Michael Reese hospital campus, including the irreplaceable Bauhaus-inspired Reginald Isaacs/Walter Gropius buildings that are among nearly 30 structures the city is rushing to wipe off the face of the earth, perhaps as early as July, to create a scorched-earth tabula rasa for a billion dollar athletes village. 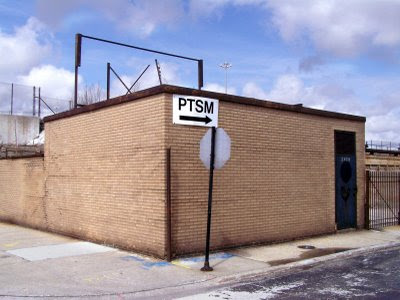 The tour begins at 2:00 p.m, Sunday, May 17th, under the brick archway that spans 29th Street at South Ellis. Info here. And if it takes a village, what does a village take? Check out this Crain's Chicago Business report on a talk by 2016 bid committee head Cassandra Francis. Eight athletes in a two bedroom condo using temporary walls. And kitchens will either have to be "walled off" or made inoperable because - fun fact - the IOC proscribes athletes eating anywhere but the official dining halls. 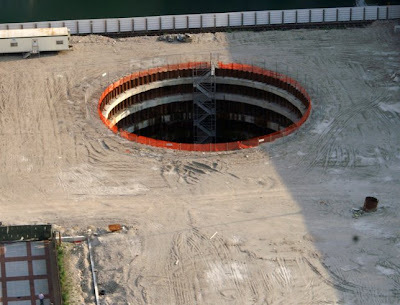 Before the economic meltdown, lenders might finance up to 90% of the cost of a megaproject like this - now it's more like 60 - 70%. One developer is quoted in Crain's that "someone's going to have to come to the table to fill the void." Let's see, just who could that be, I wonder, momentarily channeling Dana Carvey's Church Lady, hmmmmmmmmm, could it be . . . . . . TAXPAYERS??? Would a Chicago Olympics actually learn from the debacle of Block 37, or simply be its next reincarnation? Here's hoping having the bid committee headed up by a Cassandra is a fact completely devoid of prophetic overlay. 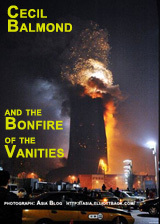 from correspondent Bob Johnson . . . 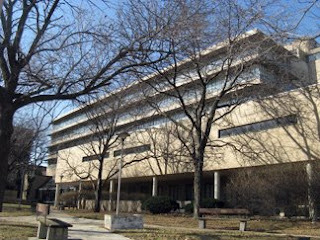 In 1979, the great Harry Weese created a study for the U.S. 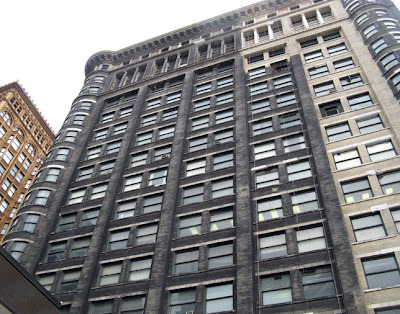 Interior Department, Four Landmark Buildings in Chicago's Loop, that laid options for the adaptive re-use of four of Chicago's most important early skyscrapers. 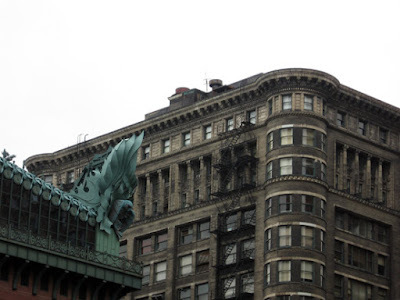 Two of those buildings found loving owners - William McDonnell in the case of the Monadnock, and the MacArthur foundation for the Marquette - who painstakingly restored them to their original glory. The Manhattan was converted to condo's. 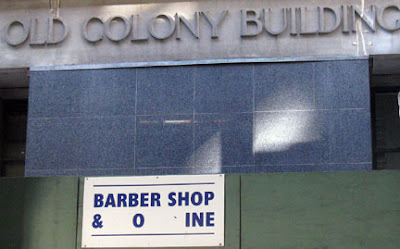 Only the Old Colony, despite being designated an official Chicago landmark in 1978, failed to find a saviour. 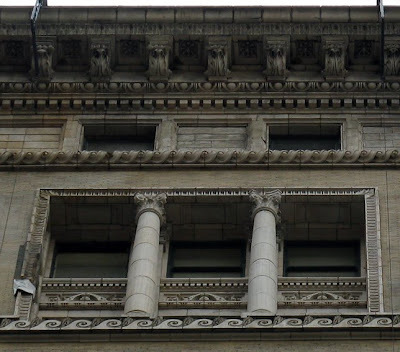 In 1979, its 133,000 square feet were 85% leased, but in a Crain's report from this past March, one of the building's angry tenants said it had largely "emptied out" as the Old Colony, under an ownership group headed by a man Richard M. Daley once labeled a slumlord, became increasingly dilapidated. Crain's reported the building has now been bought by Joseph Cacciatore & Company, although no one at Cacciatore was talking, and their ultimate plans remain unknown. Already, however, there's a very distinctive evidence of the new owner on Dearborn street (and thanks to Joel Flaxman for tipping us off about this.) Decades of grime that have given the Old Colony, for as long as anyone can remember, the patina of a coal bin, are being cleaned away to reveal - surprise, surprise, a light handsome brick. 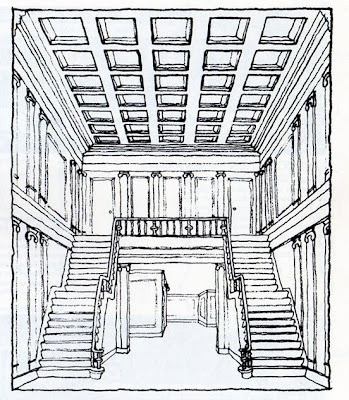 The arcade, beneath the still-intact cornice, is revealed to be, not the dank aerie to which we've grown accustomed, but a wonderfully bright and graceful vertical coda. 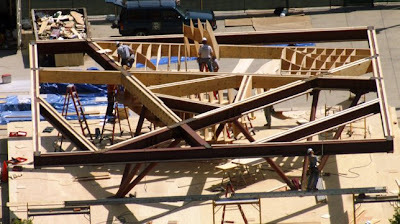 The amount of work needed to bring the Old Colony back, inside and out, is almost beyond imagination. But here's hoping. Yes, it never ends. Here's six more events we've just added to the May calendar, and no, it only seems that the only two things anyone has an interest in are Burnham and the 2016 Olympics. This Tuesday, May 12th, they'll be a 6:30 p.m. panel discussion, Telling the Story of Public Housing: Competing Narratives and the Role of Journalists, co-sponsored by the National Public Housing Museum, at the Chicago History Museum. 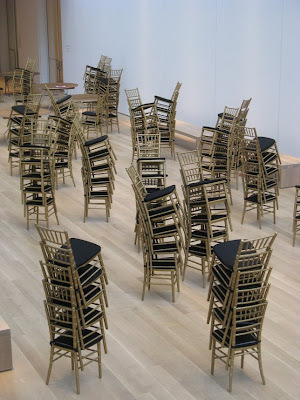 On Thursday, May 14th, Mark Rosenhaus discusses Fibonacci Numbers, the Golden Rectangle, and Geometry in Nature at the Hafele Chicago Showroom. On Friday, the 15th, architect Thom Green talks about his Unbuilt Projects and Fantasy Architecture at the Edgewater Historical Society Museum. On the morning of Wednesday, May 13th, Cassandra J. Francis, Director, Olympic Village Development, Chicago 2016, Olympic and Paralympic Bid, will discuss Planning the Olympic Village, at the University Club for the Goldie B. Wolfe Miller Women Leaders in Real Estate Initiative. 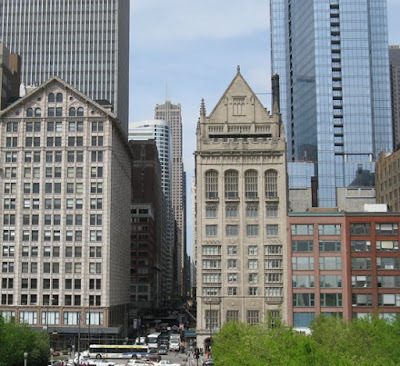 On Tuesday, May 26th, Edward H. Bennett III and Arthur H. Miller talk about Burnham's Recruiting Bennett for the Plan of Chicago for the Chaddick Institute of Metropolitan Development, at the Cliff Dwellers.
. . . and on Wednesday the 27th at the CAF, you can hear Daley stalwart Lori Healey, currently Chicago 2016 President, spin why there's no absolutely alternative but to immediately smash every Reginald Issacs/Walter Gropius building on the Michael Reese campus to make way for the Athletes Olympic Village that will, of course, not be needed until 2016, seven years away. She'll be interviewed by Lee Bey for an event titled: The Chicago 2016 Olympic and Paralympic Bid. 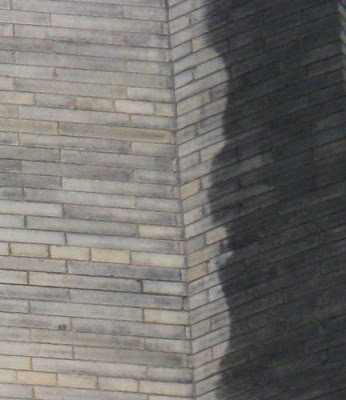 One last reminder that you can personally view the buildings in question and form your own opinion next Sunday, May 17th, with the Architectural Tour of the Michael Reese Hospital Campus and the Threatened Works of Walter Gropius, which kicks off 2:00 p.m. under the brick archway spanning 29th Street at Ellis Avenue. 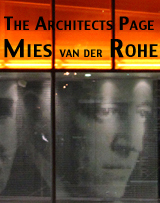 The tour is co-sponsored by the Gropius in Chicago Coalition, Chicago Bauhaus and Beyond, and Preservation Chicago. The tour is free, but there's a suggested $10.00 donation to offset costs of continuing research. 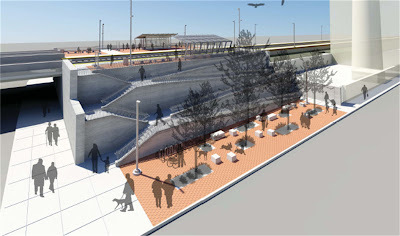 Just this week, there's also Adrian Smith at CAF, a lecture on the history of streetcars by the CTA's David Wilson for APA Chicago, and John Lupinos talking about the new Nichols Bridgeway to the Art Institute's soon-to-open Modern Wing, also at CAF. 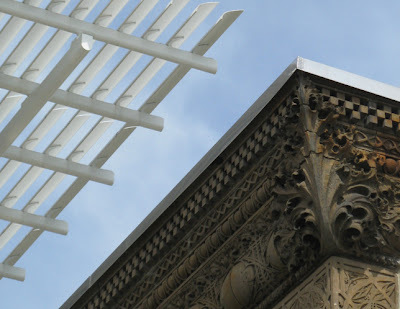 In all, I counted some 17 events this week alone, and that's not including the over 100 tours this Saturday as a part of this year's Great Chicago Places and Spaces. Check out all the events on the May calendar here.